The F45 Freaks, as we're calling ourselves, have just finished up our first 4 weeks as a gang going into the big 8 Week Challenge. It is Mike, Eddie & Nick's first time signing up for such a gruelling and intense 8 Weeks, while for Samuel and myself, it was our second round, in a row. If you've haven't met the gang, check out my intro post, you'll see we are all very different. Different in body shapes, sizes, abilities, ages and lifestyles. We wanted to show you no matter your age, ability or history with fitness, you can subscribe to a new approach of integrating fitness as part of your routine. And the reality is when you keep at it, you'll see results. How good really depends on how often you go, how hard you attack the sessions and of course the diet, which is even more important than the sweating it out in the 45min sessions. So we're at half way. It's a great milestone for us guys and it's amazing how quickly the 4 weeks roll around. We all got our baseline measurements completed before we began this challenge and now we're at the halfway mark, it's time to do a pit stop and see how we're all tracking, with a particular focus on body fat percentages to give us a real indicator on how our bodies are physically responding to the high-intensity training. THE HALFWAY LINE. WEEK FOUR. I've been blown away by the continual challenge of F45. It's always tough and has you dying in different ways every workout. My favourite part of the journey so far has been doing it as a group. Honestly, without the team element it would have been much harder. I probably would have given up when I had other social opportunities arise. It keeps you honest when you're doing it with mates. I'm happy with my progress so far but know I'll need to keep up the focus in order to keep making gains. I've dropped 2% body fat and 2kgs. Another 2 to 3 of both and I'll be stoked. One week of hell and three weeks of fun! This journey started with a workout called Hollywood. I won't lie I actually thought I was going to puke 5mins in but managed to fumble my way through the workout, crawl home and collapse into a ball of hurt! Three days later after my arms and legs..... in fact my whole body stopped hurting, I was back! But again it was so so so hard but when you workout with mates they got me through the hurt. Workout by workout it started to become addictive .... not easier but fun. The people that come here day in, day out make this whole experience so much FUN! Ps combo this with eating better and lay off the beers for a bit and I promise you the results will come. My results are both good and just ok. I've lost over 4.5kgs which I'm stoked with and a net loss of just over 1% body fat so now at 14%. While that is a bit disappointing I know the gains for the next 4 weeks with flip around to greater losses in BF and less on the weight! For me this is about a sustainable change in my lifestyle and I know this is beginning. Due to some work changes and work being busier than usual, I haven't been unable to train as much as I would have liked and considering my diet not being 100%. I am happy with the results and great to see myself maintaining a relatively low level of body fat. The great thing about F45 is I have been feeling more agile and moving better than I have in a long time. Having been out of competitive sports for the last few years it’s great to be able to go back to a social Judo training and have the body move the way it should. The last 4 weeks has also been fun from a social side as I get to know more and more of the people there. I have been really enjoying the training sessions the fellow F45'ers and this bunch of guys who have been keeping me accountable for turning up and we've done a few dinners to help try keep the diet on track. So I've had a fairly rocky start to my second go at this 8 week thing, as for the first 2 weeks I was down and out with the man flu (like the real deal with a head cold and lost voice). So in reality I've been on the backfoot. Nonetheless, no excuses right?! My eating has probably taken a backseat too. Here's a good example - I had date night the evening before weigh in and decided to eat a burger and a doughnut cause who wants to eat a salad on date night? Not the smartest choice, I know, but that's life right? You've got to enjoy yourself and when you've been training hard, regularly, you deserve a little treat (well I think so anyway). Just remember what you feed your body is extremely important as that's the fuel to get you through the training and help the body repair. Much like Samuel I've also hit a plateau in terms of results. The infamous wall that can happen after a period of training means the body is adapting to program. Typically what needs to happen to get over or through the wall is you need to change up the pattern. So for me moving forward, I'm going to do more early morning sessions instead of lunchtime, this will confuse the body and make it work hard at the start of the day and continue to burn throughout the day. I have always been very active. Both my parents are active and fit people so I guess you can say I’ve always been on a first name basis with it. I decided to get in the industry when I was 21. I had been doing a couple of different tertiary studies which I didn’t really get into so I went to a careers advisor where she suggested I give Personal Training a go. So I did and here we are. 2. What surprised you about F45 when you first were introduced to it? The biggest thing that surprised me was that all the workouts and exercises were up on the screens. It makes things a lot easier not only for us as trainers but also for the members trying to follow the workout. I had never seen that before. 3. How do you keep motivated? Any tips & tricks? My Days are quite varied but typically I would wake up between 4 -5.30am and either go to work at F45 or do a workout either in a class or at my other gym. Then from 8am to either 11.40am or 1.30pm I have my own clients outside ofF45. If sometimes I have an hour or 2 between clients I might go for a walk or do some book work. After my morning sessions I will (if I didn’t workout in the morning) go workout and then have lunch after which I will spend an hour or so relaxing before I undertake some book work. Then between 4 - 7pm I will have more sessions either at F45 or my own clients. After which I either head home for dinner or to the Glen Innes pools for a spa then home for dinner. I’m in bed typically between 8 – 9pm. Once again it differs depending on what my goals are. But say for fat loss/toning I would typically have between 5 – 10g of branch chain amino acids which I drink with lots of water before during and (if there’s any left) directly after my workout. Then I wait between 30 – 60mins and have a protein shake with 1-2 scoops of protein and 500mls of water. Then between 1.5 – 2h post workout I’ll have a meal of some form of meat with vegetables and if it was a particularly hard workout some slow burning carbs. F45 isn't some magic trick to dropping body fat, toning up or getting fit. What you put in is what you get out. So the more you push yourself, go faster, add more reps and go bigger on weights you'll see and feel the better results, so it's not rocket science. But what is different is that this high-intensity training is working so many areas of the body within the 45 minutes and without breaks, so it keeps your heart and work rate up and the body under constant pressure. This all creates the longer burn throughout the day and your body spends more time rebuilding. Sign up to my newsletter to be updated on our progress for the remaining weeks and be sure to be following my social channels on Facebook & Instagram to see snippets of what we're up to. If you're interested in trying F45 for yourself, sign up online for a Free 7-Day Trial or get in touch with me, it'd be awesome to have you there training with us. 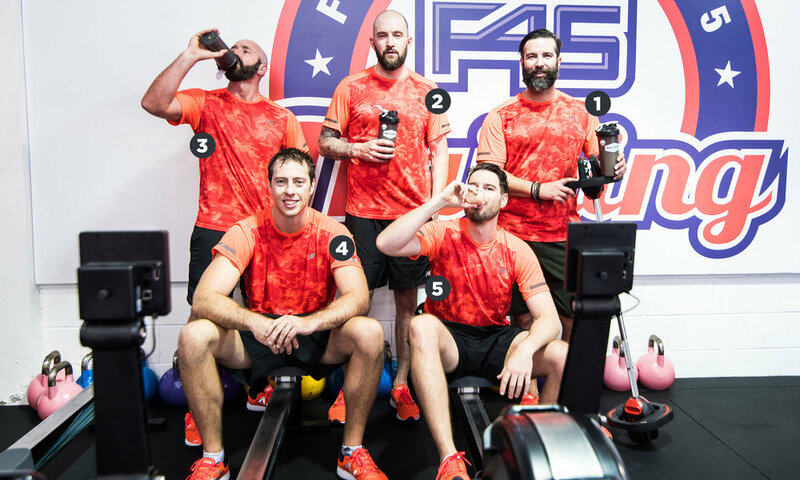 Unlike many typical gyms, where you're left to your own devices, F45 is a community. It's team training, full of like-minded people from all walks of life with various degrees of fitness capabilities. Hopefully catch you at F45 Training Newmarket. Don't wait, just do it. Thanks to our awesome team of sponsors who are helping us through the challenge. New Balance NZ for the fresh new season tops, shorts and runners, Whey House for the much-needed post workout protein (use code F45FREAKS for 15% off your purchase) and Serious Smoothies for the delicious and easy refuelling healthy pre-packed smoothies.